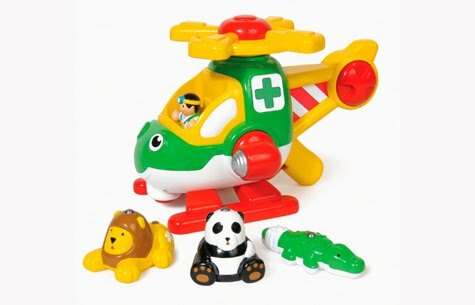 We recently had the chance to review Harry Copter's Animal Rescue from WOW Toys. "WOW toys don’t require any batteries and still have amazing functions and features to discover. We only use high grade materials and every toy is rigorously tested to make sure it is durable and safe. We would never dream of using PVC plastic. We use high grade materials that are very strong so our toys are durable and don’t break There are no small parts in our toys We don’t use any toxic materials All our toys are regularly tested by a certified independent testing house to high global safety standards And of course there are no used batteries to throw away either." Harry is always first to the scene of any animal emergency. Hold his sturdy handle and squeeze the trigger to activate his friction-powered main rotor. Then pick up the injured animals with his magnetic lift and drop them off safely by turning the searchlight. He’s also got a clicking tail rotor! 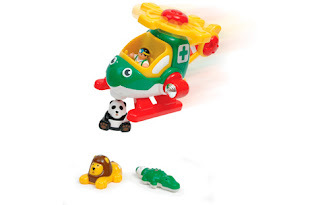 A removable vet figure and an injured panda, lion and crocodile complete this wonderful play set. From 3 years – Role-play & exploration"
What we thought: The kiddos both really enjoyed Harry Copter's Animal Rescue! They had a blast flying the helicopter and picking up the animals, then taking them back to the animal hospital to "doctor" them:) The trigger mechanism was easy for them to understand and manipulate and made flying the copter super fun. They thought the magnetic attraction between the helicopter and the animals was "like magic." Our kids are 2 and 4 and both of them enjoy playing with this toy regularly. I love that it is teaching them about mechanics, magnetism and animal care and encourages them to learn through role-playing. I also love that it is an extremely loud toy, it doesn't require batteries and it is made from materials that are safe for my kiddos. ABCD Diaries gives WOW Toys and Harry Copter's Animal Rescue an A+! Buy It: Find these super fun toys at WOW Toys! Disclosure: ABCD Diaries was given a toy for review purposes only. We were in no other way compensated. The opinions expressed in this post are ours and ours alone.